Each year I like to send out embroidered Winter holiday cards to friends and family. 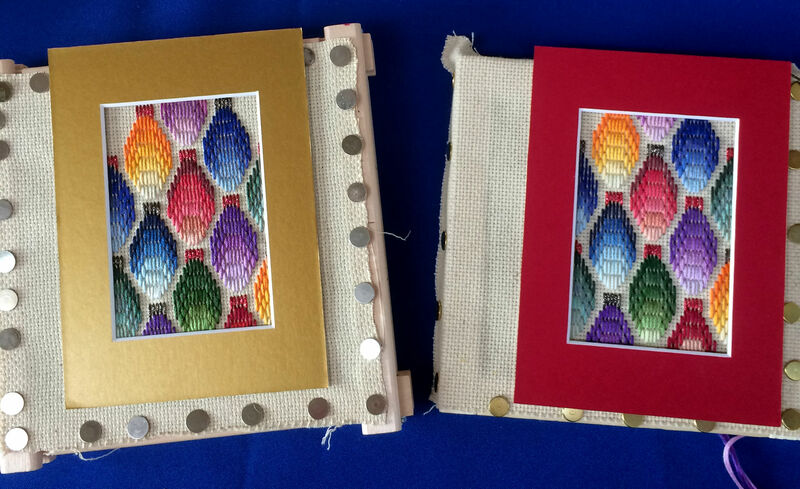 This year my design show cases the beauty of holiday lights worked in unseparated 6-strand embroidery floss. Holiday Lights is presented within a 10 plus page, full color booklet, which provides discussion of the charts accompanied by photos of the worked design. Photo below shows my trying out different colored windowed mats. The overall count for the worked area of the design is 45 by 78. This design is worked in straight stitches. Approximately 3 by 5 ½ -inches when worked on 14-count Aida fabric. 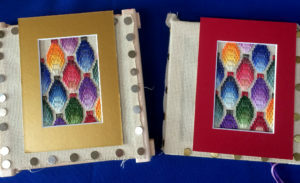 This design was created to fit within the (3 by 5-inch) window area of a 5 by 7-inch trifold card or secured within the window area of a 5 by 7-inch mat board (cardstock). The cardstock I used has a white back for writing a seasonal or personal message, if being given as a gift. Click the below image to purchase or to use the publisher’s Look Inside feature to view the first few pages of the design’s 10-page booklet.